Why don’t people just admit their privilege?! It can get pretty infuriating hearing people of privilege say oppression doesn’t exist, that anyone who says otherwise is too politically correct and/or sensitive. That meritocracy is totally how the world works. Excerpt from Ronnie Ritchie’s comic. Read the whole piece here. Heteronormativity is everywhere and not questioned. We’re presented with only one seemingly acceptable variation, which is if a queer couple acts heteronormative: gets married, buys a house, practices monogamy (this product of heteronormativity is defined as homonormativity). Heteronormativity is still the dominant narrative; it pins down people, labels them, and fits them into heteronormative roles. It can be hard to realize one’s own privilege, and even harder to accept it. A white person living in poverty, or a male person of colour, for example, still face oppression despite the colour of their skin or performed gender, so how can they be privileged? This is where intersectionality comes into play. 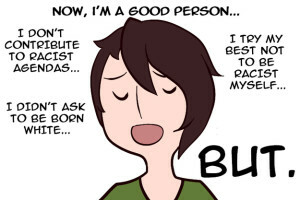 Factors like those mentioned in Ritchie’s comic determine certain privileges and oppression. Yes, Patricia Arquette was right when she said sexism needs to be addressed. No, she was not right in alluding that sexism only oppresses white, hetero women. At risk of showing my keener attitude as a first year undergrad, I’ll link to Peggy McIntosh’s White Privilege: Unpacking the Invisible Knapsack. Starting with, “I was taught to see racism only in individual acts of meanness, not in invisible systems conferring dominance on my group.” She then lists privileges she has a white person, that she may not have noticed before. Privileges like: being able to challenge a situation without being called a credit to her race; knowing her voice will be heard in a group of white people; and knowing her children will learn about their race’s existence in school. 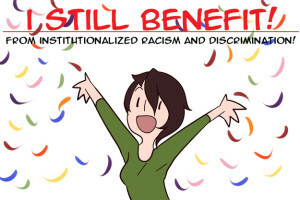 These privileges can apply to other privileged and oppressed groups, too. So, what if you understand that oppression exists, but as a person in a certain place of privilege, you want to be an ally? This can be tricky at times, but there is a solution: shut up and listen. Certainly, stand in solidarity and show your support. But, realize that there are times where those you’re being an ally to do not have the same chances to speak as you, so let them have their chance. This can be hard when you want to show you care or are passionate about equity among people. Remember, in these situations, where you are a member of the dominant group, it isn’t about you. The best thing you can do is listen. That is more important than feel goodism. But, but, it just doesn’t seem fair! What about men’s day, white history month, a straight pride parade? Well, a straight pride parade is any time a passing heterosexual couple can walk into the store without being harassed. White history is what we are taught right away in school. And since we live in a patriarchy, every day is men’s day. Again, if we are already in the dominant group, we may not notice these things in our lives. And if we are oppressed in other ways, it can be hard to understand that we have any upper hands in life at all. Excerpt from a comic by Jamie Knapp. When we do notice our privilege, it can get pretty yucky feeling. This doesn’t mean we get to run from it, we need to face it and deal with all the nastiness so we can properly understand. Recognizing our own privileges doesn’t demonize us; it doesn’t mean we exploit our privilege purposely. It does mean that we benefit from privilege. It is up to us what we do with it and how we can build an equitable world.